Discussion in 'SWNN News Feed' started by SWNN Probe, Jul 2, 2018. 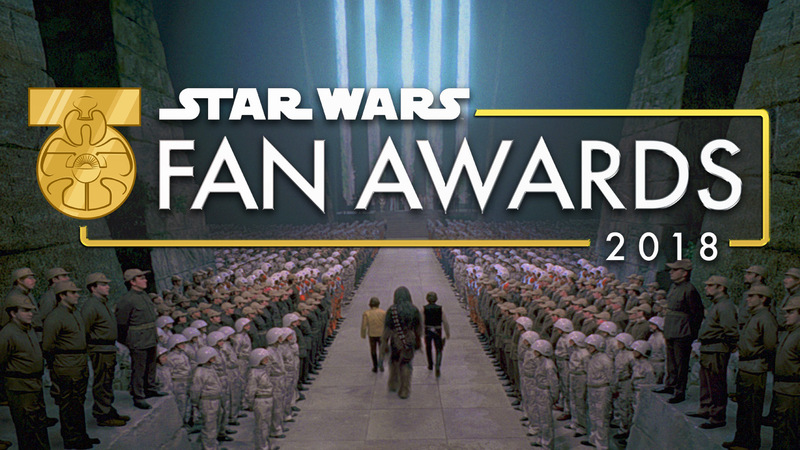 Lucasfilm and StarWars.com have just announced the Star Wars Fan Awards 2018 as a means to celebrate the Star Wars fan community in all its amazing creative glory. Submission of entries begins in a couple of weeks, so it's time to get those creative juices flowing. Winners will be chosen by a panel of Lucasfilm judges, and a special Audience Choice Award will be voted on by the fans in November. Read on to find out about the categories and how you can enter the contest! Stay tuned to StarWarsFanAwards.com for updates. Submissions open at StarWarsFanAwards.com on July 18 and close September 17. Audience Choice award voting opens at StarWarsFanAwards.com on November 2 and closes November 13. Looking forward to watching the winners. Agreed. This comment from the website: "Open to legal residents of the 50 U.S. & D.C., Canada (excluding Quebec), Japan, Australia, New Zealand and Puerto Rico who are 13+ at time of entry." Strange. Some sort of legal agreement or something? And Canadians are OK EXCEPT for those from Quebec?